Eastern Townships Breweries The breweries in the early days of settlement in the Eastern Townships were managed by anglophones and Loyalists. These people had started to move into this area during the time known as the British Colonization period (1820-1850). Their glory days were between 1880 to 1920, in a time known as the urbanization and industrialization phase. Unfortunately, little has been written about the history of beer making and breweries in the Eastern Townships (3). The first brewery in this area that we are aware of, according to historian Jean-Pierre Kesterman, was the Charleston Brewery. Any business having to do with this brewery, located in Charleston (today Hatley) took place around 1820 with production ending in the late 1840's. In 1837, a second brewery, this time in Lennoxville, opened its doors and was known as the Lennoxville Brewery. This company went bankrupt around 1875 due to the recession taking place between 1873-1879 and, the opening of another brewery, the Spring Brewery. This particular brewery was the first to be built in Sherbrooke and the owner, Henry Philips, was an early brewer in Montreal. Built in 1859, it was sold ten years later to a man named C.H. Fletcher. This brewery was commonly known as the C.H. Fletcher Brewery until it closed its doors in 1887. The Spring Brewery closed their books after a minor fire in 1887 and sold their equipment to another brewery, founded just the previous year, the Burton Brewery. The Burton Brewery (5) was identified as the ''successor'' of the Fletcher Brewery. It sold many products at the turn of the 1890's, notably Bitter Pale, mild beers, dark Porter--in pints and half pints. The Indian Pale Ale under cap became the rage. The Burton Brewery took the name from the birth place of the manager (Burton-On-Trent, capital of English beer making). There was a particular reason that made Burton stand out as a brewery. They were the first brewery to implement a system of home delivery to their customers. 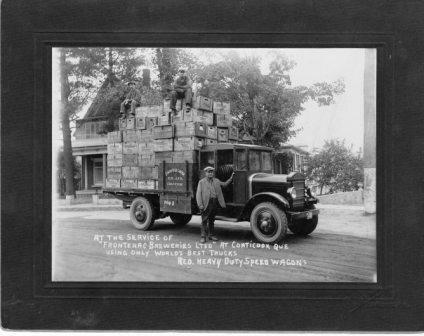 These deliveries were made by horse drawn wagons and deliveries could be made every 15 days. Most breweries in the Townships were in business for short periods of time. There was one brewery which was, without question, the most prosperous brewery of the time. The name of that brewery was the Silver Spring Brewery (6). This brewery was founded in Sherbrooke in 1896 and sold their products not only on the local level but also nationally, predominantly in Ontario. Sales were also carried out in the Maritimes as well as in the western provinces. Annual production in a space of ten years attained nearly 750,000 gallons of beer. The Silver Spring Brewery produced Whitecap Select, Indian Pale Ale and Cream Porter. This was the last local brewery in the 1920's to go up against the larger Canadian breweries and it closed the production line in 1929. The time for the temperance movement had arrived. ''We have become a nation of drunkards! '', such was the outcry of alarm and starting point in 1815 by high society temperant americans. Americans and Canadians were feeling threatened by the amount of poverty and unemployment as well as unrestrained drinking. Alcoholism was perceived as a cause of this misery and not as one of the effects. This idea led to a number of changes in the middle class, the emergence of Protestantism, and the beginning of printing brochures or pamphlets for the public. Also, starting from 1850, prohibition gained favor in society and the simple solution seemed to be of an unanamous thought, get rid of the temptation and prohibit the sale of alcohol. The Eastern Townships did not escape this prohibitionist wave which swept through the province and the rest of the country. Despite the determination of many members, these temperant societies did not have the power to follow through. The population was becoming more and more francophone and less sensitive to their cause. This did not stop some French Canadians in 1881 from creating a league ''to combat the abuses and immoderate useage of liquors''. There were only six of sixty-five counties at this particular time in Quebec under prohibitionist laws, of which five were part of the Eastern Townships, bastion of the English speaking Protestant population of the province. One company only was able to obtain a permit during Canadian prohibition to sell alcohol in Sherbrooke, for sacramental rites, medical and industrial requirements. This situation likewise led to the lack of police resources in a growing city. Public drunkenness was the cause of more than 50% of arrests. Several municipalities voted in prohibition resulting in many citizens coming to Sherbrooke to drink. The debate on alcohol in Quebec, specifically in the Townships, little by little led to opposing views by the french speaking and english speaking people. The two groups were both aware of the dangers of alcohol but were in disagreement over the means of how to handle the situation. The french Canadian population traditionally considered beer and wine to be drinks of moderation. The clergy was of this opinion: ''A prohibition law would be an attack on personal liberty, which would forbid legal useage and which was considered to be a god given right''. The french Canadians were therefore opposed to a prohibitive law against the priviledge of using beer and wine but were in agreement with an interdiction on hard liquor. The 1917 Prohibition divided Canada and Quebec and made many francophones wealthy especially those residents living in muncipalities near the American/Canadian border. In 1917, all the Canadian provinces were observing temperance, except for Quebec. In this particular year, James Keith Edwards, a councillor from Sherbrooke, threw out a desperate proclamation: "If I was able, I would remove all the liquor licenses in the province. There is nothing so evil as the drink''. Whiskey, Beer and the Prohibition in Coaticook. The temperance movement came into being during the nineteenth century and became common. It was generally anglophone Canadians who championed the cause against drunkenness and alcohol. The high point of these movements were during the 1917 Prohibition. The first settlers arriving from the United States brought with them their customs and traditions, notably the recipe for distilled potato whiskey. Coaticook, a municipality not far from the border with the United States, was founded in 1834 by anglophone Americans. During this era, ''the distilleries enjoyed a short but profitable business in the Eastern Townships. Most of the distilleries in 1831 were to be found in this area of Lower Canada. In Stanstead, a border town, we were able to count up to at least 26 distilleries!'' Nevertheless, by the end of the 1850's, the distillery business was already on the decline. The disease which decimated potato harvesting, the temperance movements against the production of alcohol as well as small production, were some of the factors which brought about the decline in this type of industry. Despite all of this, two distilleries made their appearance in Coaticook. The first distillery was that belonging to Samuel Cleveland in 1848. It was located on East Main Street near Child Street. 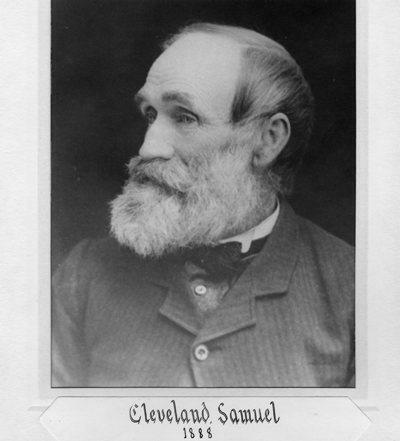 The second distillery was owned by Edmond Davis and was built circa 1851 in the same area. However, both these distilleries were in business a short time: the Cleveland distillery was only in operation until sometime in 1854. They made, among other products, white whiskey: a drink that was the best seller during the middle part of the century. The way to make the brew was simple and well known; the main ingredient was cheap and accessible. It was composed of potatoes grown on most of the farms in Barford. Nearby the two industrial distilleries in Coaticook, one could find, according to oral history and up to the beginning of the 20th century, the existance of about a dozen stills or personal breweries. They used what they could get after the surplus of the harvest (13); for some of these brewers, it was made for their own personal consumption; for others, with a financial purpose in mind, the homemade alcohol was sold at public market. The francophone population became a majority population in Coaticook at the beginning of the 1900's and hard spirits were abandoned and wine and beer became the more favored drink. In Quebec, contrary to what was happening in the rest of Canada or in the United States, the province being composed of francophones took on a different character and approach in the prohibitionist debate. The francophones were in agreement about banning hard liquor but were opposed to the interdiction of beer and wine. The policians were wary about settling the dilemma and stalled for time and a compromise. That being said, in 1918 more than a thousand locations were following the Scott Law, prohibiting the sale of alcohol within their territory. Unexpectedly the provincial government voted for prohibition. The law was not supposed to come into effect until the following year, May 1, 1919 and concerned the sale of alcoholic beverages--beer with low alcohol content (less than 2.5%) were allowed. This delay allowed time for opponents of the law to form a coalition. The brewers of the province launched a publicity campaign praising the virtues of beer. The Quebec government held a large referendum on April 10, 1919 on the question of the sale of beer and wine. French Canadians, the majority population in the province, voted in favor of selling beer and wine. It was also seen that in 1919, Quebec was the only place in North America not to be under complete prohibition laws. Only hard liquors were prohibited for sale. Numerous home run distilleries started to emerge in the Eastern Townships starting from this particular time, in many regions of Quebec. ''Bootlegging'' now officially enters into the history of smuggling in Quebec. The authorities are now faced with the contrabrand issue. The government of Quebec adopted a limited solution on March 1, 1921 with regard to the sale of alcohol. America is now under the prohibition laws...except Quebec. In the United States by 1933 Prohibition was the cause of serious social disorder, engendering the rise of a multitude of criminal activity notably the smuggling of alcohol by none more notable a person than the ganster and bootlegger, Alphonse Capone. He was also known as ''Al'' (1895-1947). Several witnesses have confirmed his presence in the Coaticook region, specifically near Hereford; as well, he stayed in a house in Saint Hermenegilde. Here he would carry out business transactions and reside for periods of time. The hotel services and types of amusement during the second half of the 19th century would play an important role in the transformation of urban Coaticook. If today, the basic function of a hotel is one of relaxation and entertainment, then it must be considered that the hotel played an entirely different role during the era of settlement. These establishments not only welcomed travellers but also hosted social and political get togethers and meetings. It would also be remiss of us not to note at this point that Horace Cutting opened the first hotel and that he was a well known businessman in the town. There were three hotels in the Town of Coaticook in 1863; twenty years later the number of hotels had nearly doubled. Important hotels of the day included: Coaticook House, the Queen's Hotel, the Canada Hotel, the Royal Hotel, the Montreal Hotel, the Grand Central Hotel and, the Thorndyke Hotel. However, from all of these hotels of yesteryear, only one building remains standing and has never relinquished its position as a hotel since 1927: the Auberge la Tourelle. At the turn of the nineteenth century, imported beers in Coaticook carved a large niche in the market. These beers included Milwaukee Lager Beer (the United States) and the Guinness products (Ireland). In the 1920's, the market became heavily influenced by the large Canadian breweries: Molson, O'Keefe, Labatt and especially those products known as Dow Ale and Dawes Black Horse. The big Quebec and Canadian breweries did not produce their beers locally and hired distributors to sell the product. 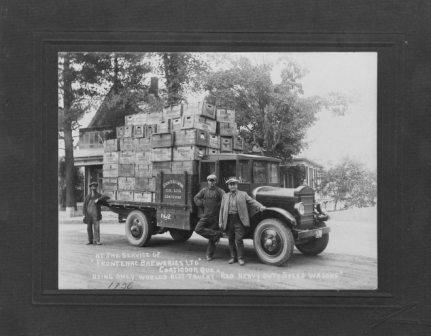 D.W. Stenson was the long time distributing agent of Molson in Coaticook and throughout the Eastern Townships. The business of V. Paradis and Sons, located on West Main St., was the agent in charge for Labatt in Coaticook (especially Porter). If one spoke about a third brewery of importance in the Coaticook MRC, that would certainly have been the Frontenac Brewery. Founded in 1911, they brewed, amongst other types, the Frontenac Blue Label Lager. During the years between 1920-1930, this beer achieved a certain popularity, principally as a choice of Americans due to the prohibition taking place in the United States. It was the best seller during the prohibition era. The newspapers of the day were heavy in advertisement--especially for Dow and O'Keefe. Throughout all of these years only two large breweries saw fit to draw up advertising murals in promotion of their products. Around 1923, a panel (recto verso, approximately 1m X 2m) boasted the virtues of Black Horse Ale. It was situated on the land belonging to a Mr. Cote in North Coaticook. No road passed yet in this area but the advertisement could be seen by passengers on the train that cut across his property. The Dow Brewery gave Mr. Cote $50 a year, an important amount at this time. As for the other advertisement, dated to the year 1925, this particular mural was drawn up by the Molson Brewery. There was an agreement with Mr. Cote to maintain the exterior paint on the family barn, located very near to the Dow advertisement. It is still possible today to see the worn tracings which are in the process of disappearing from the advertisement on the walls of the barn. The last coat of paint was probably applied in the 1950's.